DONT SLEEP has partnered with Maleah Solange Books to bring a series of unique local Black authors to educate and raise the consciousness level of Indianapolis! 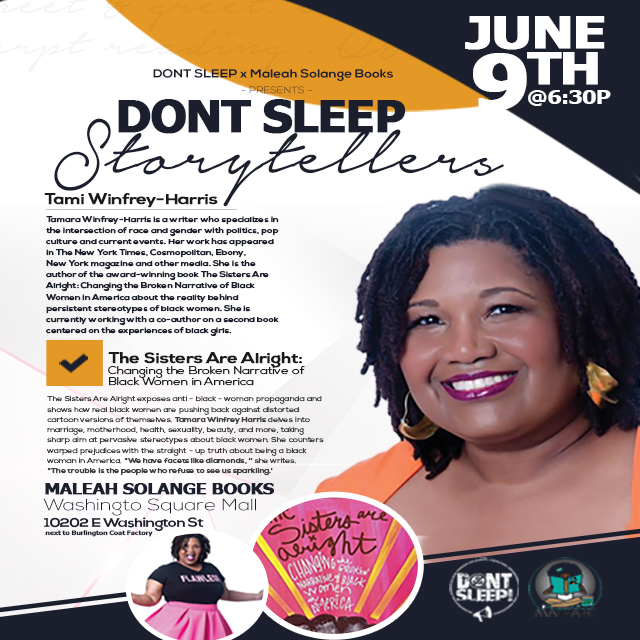 Welcome the first of our featured DONT SLEEP Storytellers, Tami Winfrey-Harris!!! Tamara Winfrey-Harris is a writer who specializes in the intersection of race and gender with politics, pop culture and current events. Her work has appeared in The New York Times, Cosmopolitan, Ebony, New York magazine and other media. She is the author of the award-winning book The Sisters Are Alright: Changing the Broken Narrative of Black Women in America about the reality behind persistent stereotypes of black women. She is currently working with a co-author on a second book centered on the experiences of black girls. This event will take place at Maleah Solange Books, located in Washington Square Mall located next to Burlington Coat Factory.